On top of any existing DIRECTV discounts and promotions, you can save $10 off your billing for 10 months (a total of $100 saving) through the Refer-A-Friend program and receive a $200 Costco cash card. 1) Go to Costco.com and enter "DIRECTV" in the search bar. 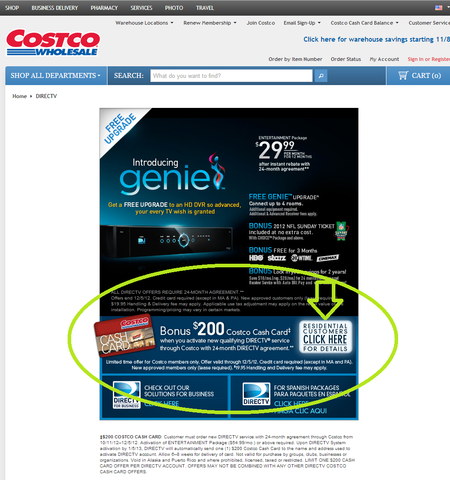 2) You should see DIRECTV Costco cash card promotion page. Click on "Residental Customers Click Here for Details" box. It should take you to DIRECTV Costco Connection Center. This will activate the cash card promotion. Don't do anything else on this page. Next, Open a new window or tab. 3) Copy and paste the following text [ http://www.directv.com/refer ] into a new tab or window of your web browser. Make sure you do this in a new tab or window from your browser! Copy and paste the following referral code [ 68570923 ] where it says "Enter your friends DIRECTV account number here"
Now click on "Get Directv" below it. 4) After you add your programming package, you should see the $10 off for 10 months under "Discounts" on the checkout page. 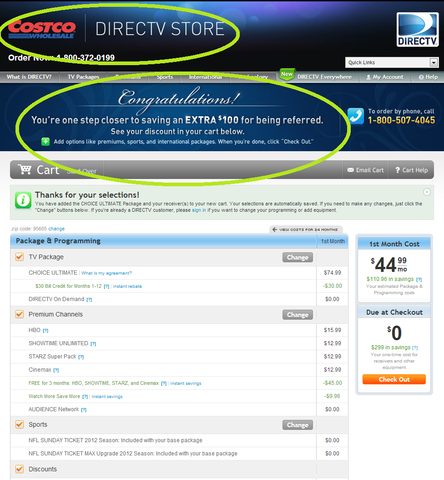 Make sure there is "The DIRECTV Costco Connection Center" banner on top of the checkout page. This will ensures that you will get the $200 Costco cash card. When you scroll to the bottom of the page you will see the referral discount. Complete the purchase and you will receive the $200.00 Costco Cash Card in a few weeks. A Groovy Congrats and thank you!! !